Overall I have been onside with Christopher Priest’s run on Justice League, but the story seems to derail a bit in the latest issue. To be fair, that might be due to the cover. 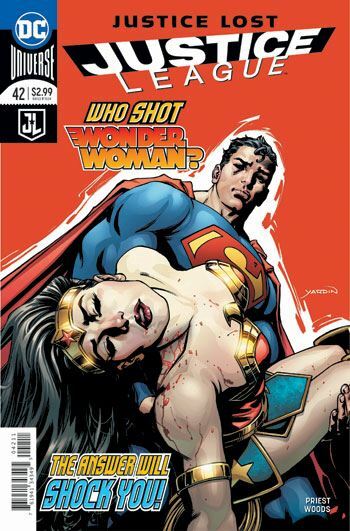 The tease about the revelation of who shot Wonder Woman had me expecting some giant twist. As a result, the truth was a let down, and the remainder of the issue just felt a bit sour. That is a shame, as there are good things going on here. Deathstroke proves to be more important than expected. Although, considering that the Red Lion is so prominent in the tale, and comes from Deathstroke’s book, that shouldn’t have been so surprising. Certainly Priest is not shying away from being controversial. Even though the story deals with African politics, the two Green Lanterns wind up discussing the Israel/Palestine situation, always a powder keg to mention. Even as I write this review I am waffling back and forth on the issue. It’s the second last chapter of the story, and while the conclusion might pull off a great resolution, the story really doesn’t seem to be winding up. This issue feels much more like a middle chapter, and that doesn’t bode too well for the next issue. Deathstroke also sort of overshadows the League members in this story, getting a lot more time on panel than any individual member of the team. 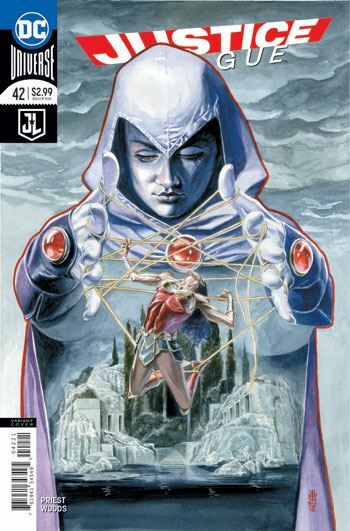 So while there is nothing in this issue that actually pissed me off or turned me against the book, there was also very little that really excited and engaged me. Priest has lead me to expect more from his work.